Hope to see you at some! If you want to make a package, check out this gist: https://gist.github.com/SchizoDuckie/2a1a1cc71284e6463b9a. Apple has published a new page that goes through all of the settings and commands available via MDM and explains many in much more detail. This is available at http://help.apple.com/deployment/mdm/. The new guide is a great addition to the work @Mosen has done at https://mosen.github.io/profiledocs/ in terms of explaining what each setting, command, and payload do. And let’s not forget the definitive MDM protocol reference guide, available at https://developer.apple.com/library/content/documentation/Miscellaneous/Reference/MobileDeviceManagementProtocolRef/1-Introduction/Introduction.html#//apple_ref/doc/uid/TP40017387-CH1-SW1. Overall, I’m excited to see so much information now available about MDM, including how to develop an MDM properly, what each setting does, and now what you should expect out of an MDM! 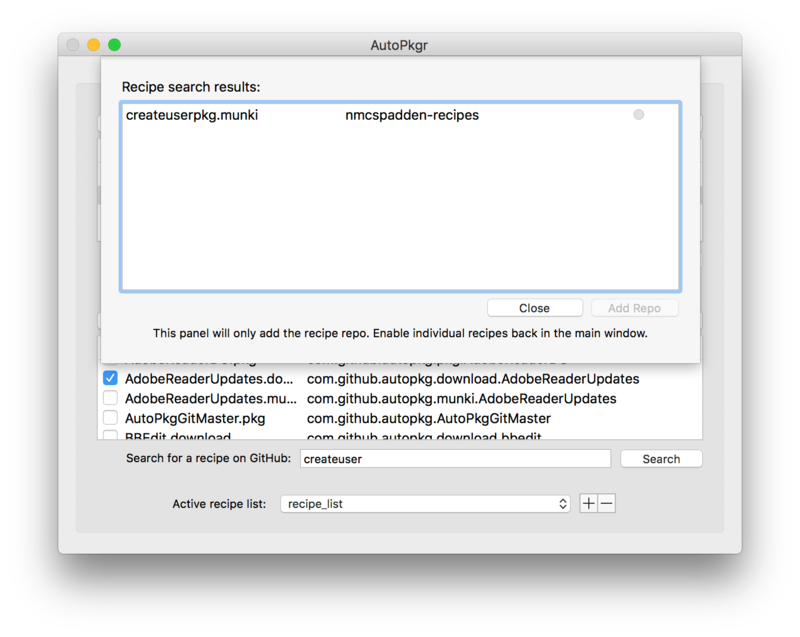 Autopkgr is basically a small app that allows you to select some repositories of recipes and then watch and run them when they update. It’s a 5 minute or less installation, and at its simplest will put software packages into a folder of your choosing so you can test/upload/scope to users. Or you can integrate it with 3rd party tools like Munki, FileWave, or Jamf using the JSSImporter. Then if you exceed what it can do you can also dig under the hood and use Autopkg itself. It’s an app, and so it needs to run on a Mac. Preferably one that doesn’t do much else. You can obtain the latest release of Autopkgr at https://github.com/lindegroup/autopkgr. To install, drag the app to the Applications folder. 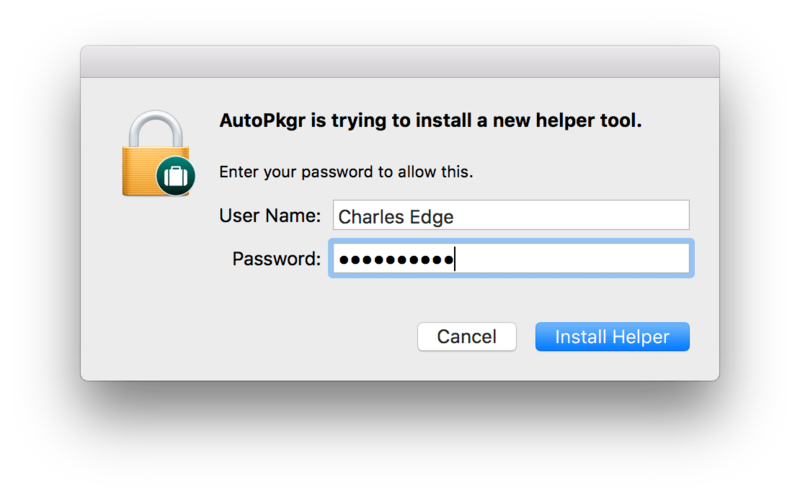 When you open AutoPkgr for the first time, you’ll prompted for the user name and password to install the helper tool (think menu item). The menu item then looks like the following. These are the most common tasks that administrators would run routinely. They involve checking Autopkg recipes to see if there are new versions of supported software titles, primarily. 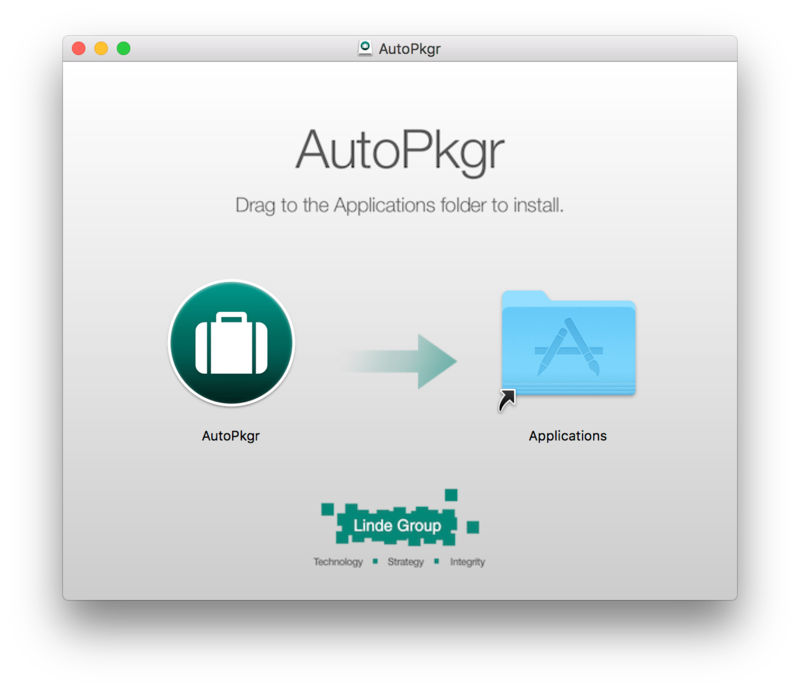 Opening the Autopkgr app once installed, though, shows us much more. Let’s go through this screen-by-screen in the following sections. By default, when installed with Autopkgr, Autopkg stores its cache in ~/Library/AutoPkg/Cache and the repos are sync’d to ~/Library/AutoPkg/RecipeRepos. You can move these using the Choose… button in the Folders & Integration tab of Autopkgr, although it’s not necessary (unless, for example, you need to move the folders to another volume). Note: You can also click on the Configure AutoPkg button to add proxies, pre/post processing scripts, and GitHub tokens if needed. 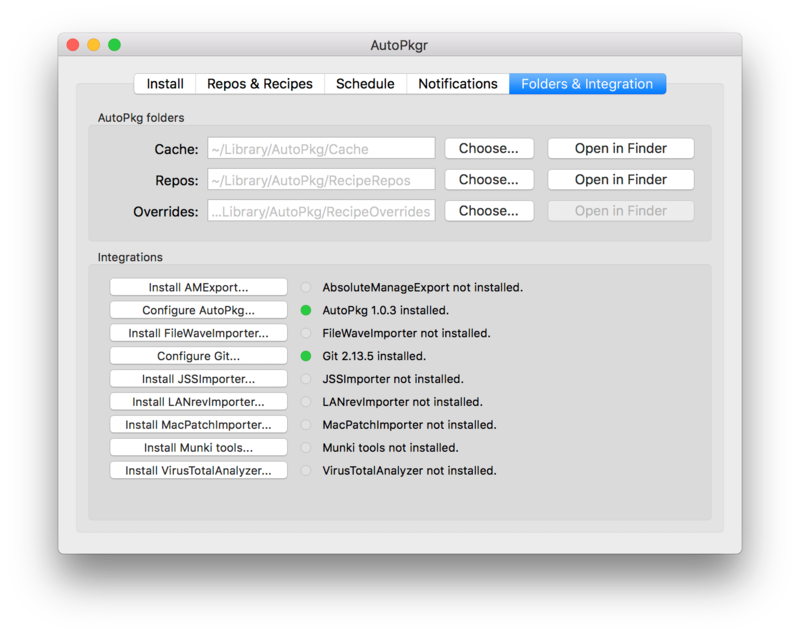 The Install tab is used to configure AutoPkg settings. 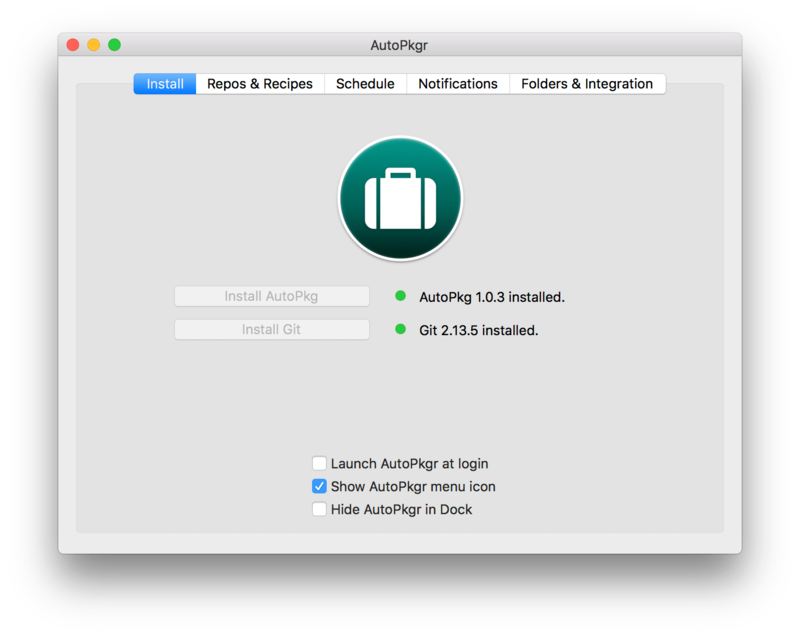 If there is a new version of AutoPkg and Git, you’ll see an Install button for each (used to obtain the latest and greatest scripts); otherwise you’ll see a green button indicating it’s up-to-date. 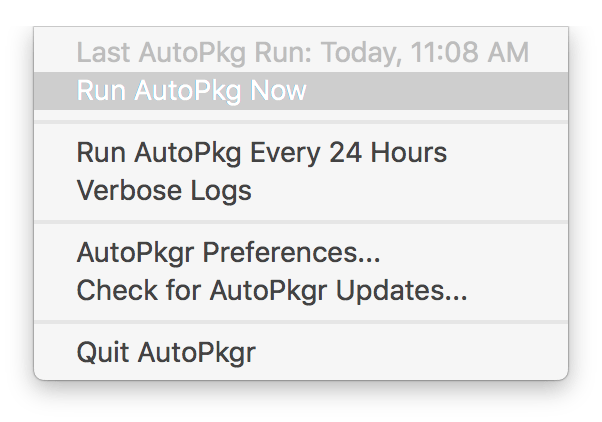 You can also configure AutoPkgr to be in your startup items by choosing to have it be available at login, and show/hide the Autopkgr menu item and Dock item. Repositories are where collections of recipes live. Recipes are how they’re built. Think of a recipe as a script that checks for a software update and then follows a known-good way of building that package. Recipes can then be shared (via GitHub) and consumed en masse. To configure a repository, click on the “Repos & Recipes” tab in Autopkgr. Then select the repos to use (they are sorted by stars so the most popular appear first). Note: There are specific recipes for Jamf Pro at https://github.com/autopkg/jss-recipes.git. Then you’ll see a list of the recipes (which again, will make packages) that AutoPkgr has access to. Check the ones you want to build and click on the Run Recipes Now. If you don’t see a recipe for a title you need, use the search box at the bottom of the screen. That would show you a given entry for any repos that you’ve added. Again, all of the sharing of these repos typically happens through GitHub, but you can add any git url (e.g. if you wanted a repo of recipes in your organization. 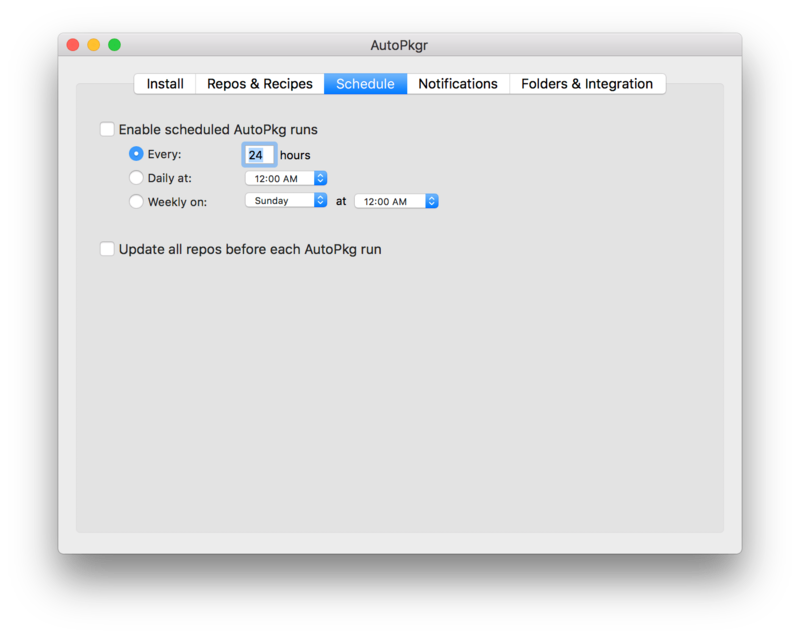 Once you’ve checked the boxes for all the recipes you want to automate, you can then use the “Run AutoPkg Now” option in the menu items to build, or rely on a routine run, as described in the next section. 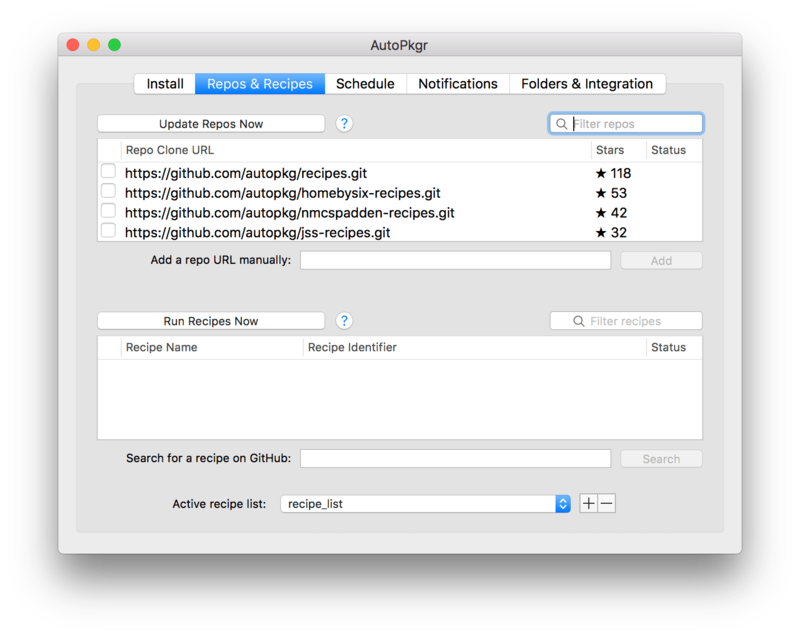 Autopkgr can schedule a routine run to check recipes. This is often done at night after administrators leave the office. To configure, click on the schedule tab and then check the box for Enable scheduled AutoPkg runs. 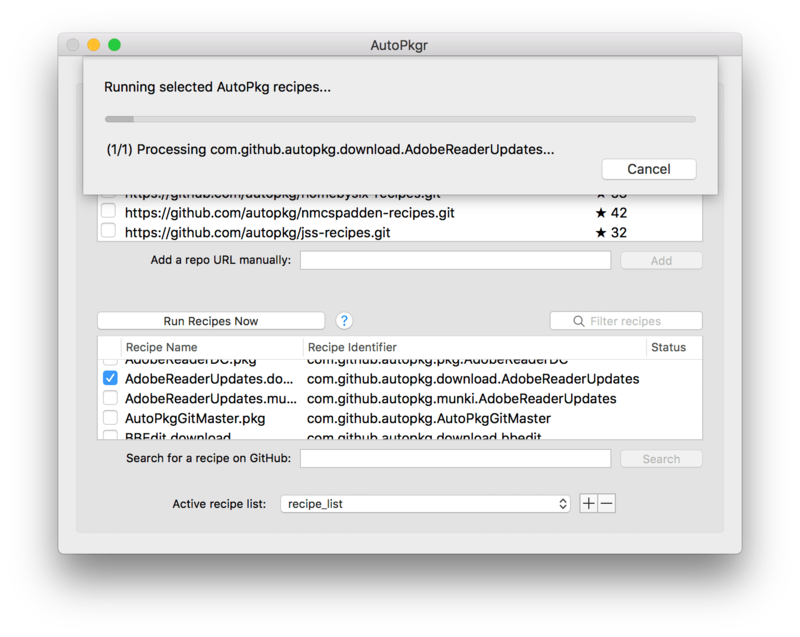 You can also choose to update your recipes from the repos by checking the “Update all recipes before each AutoPkg run” checkbox. I know this sounds crazy. But people like to get notified when there’s a new thing showing up. To configure a variety of notification mechanisms, click on the Notifications tab in AutoPkgr. Here, you can configure alerts via email, Slack, HipChat, macOS Notification Center, or via custom webhooks. When integrating with another tool, you’ll need to first install the integration. 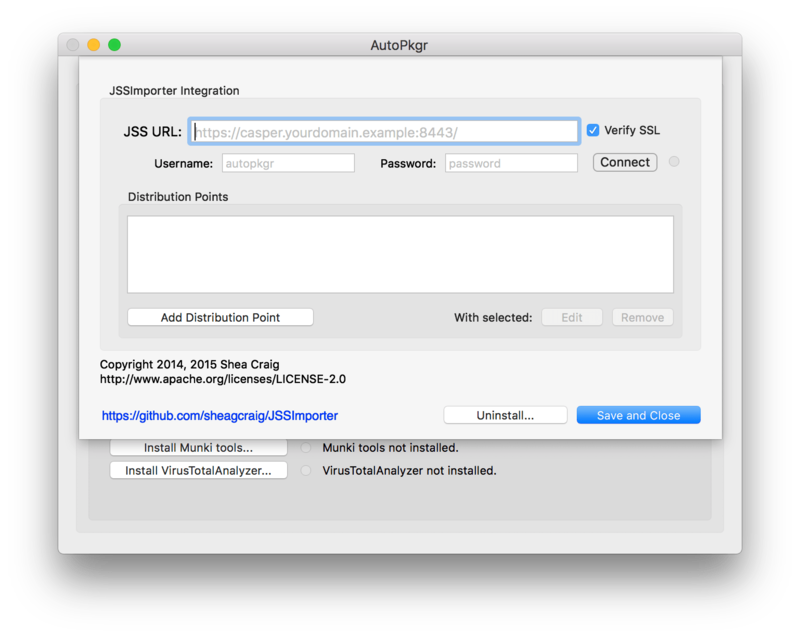 To configure the JSSImporter, we’ll open the “Folders & Integrations” tab in Autopkgr and then click on the Install JSSImporter button. Once installed, configure the URL, username and password (for Customer API access) and configure any distribution points that need to have the resultant packages copied to. Once the JSSImporter is configured, software should show up in Jamf Pro scoped to a new group upon each build. It is then up to the Jamf Administrator to complete the scoping tasks so software shows up on end user devices. No clear text password or interactive option was specified (adduser, change/reset password will not allow user to use FDE) ! sysadminctl -resetPasswordFor krypted -newPassword newsupersecretpassword -passwordHint "That was then this is now"
Note: In the above, we quoted the hint, which is supplied using the -passwordHint option. If it was one word we wouldn’t have needed to do so. Usage: sysadminctl [[interactive] || [-adminUser -adminPassword ]] -deleteUser [-secure || -keepHome] -newPassword -oldPassword [-passwordHint ] -resetPasswordFor -newPassword [-passwordHint ] -addUser [-fullName ] [-UID ] [-shell ] [-password ] [-hint ] [-home ] [-admin] [-picture ] -secureTokenStatus -secureTokenOn -password -secureTokenOff -password -guestAccount -afpGuestAccess -smbGuestAccess -automaticTime -filesystem status Pass '-' instead of password in commands above to request prompt.